After the ‘official’ disbanding of X-factor, one of the government’s previous attempts at a federally-funded mutant team, certain factors felt that the current administration had to show they were still willing and capable of having a mutant team they could control. Foremost in this was Oswald Geraldo, a Mutant Rights activist, lobbyist and a mutant himself. Wishing to avoid issues with dealing with established mutant figures Agency X, then under the Dept. of Justice, was formed and it was decided to recruit young mutants and other persons with special ‘gifts’ who recently became publicly known. Unknown to a majority of the agency, a partial list of candidates had already been made by Oswald, after consulting Charles Xavier on several teenagers he was presently tracking using his mutant locating supercomputer, Cerebro. In short order Brock Lawson, Joseph Salinas, Alora and Trisha Gannon were signed on as the first members while work began in refurbishing a missile silo as their new headquarters in Twin Sister Peaks, Colorado that had been decommissioned at the end of the Cold war. Lacking a proper curriculum or basic knowledge in how to train or turn such a group into a honed and cohesive fighting force, Agency X attempted to find several individuals who might fill in as instructors. Among several of them were Captain America, Cable, Taskmaster, and Professor Xavier. All were reluctant given the still dubious nature of the program and its intended goals. Taskmaster finally dropped out due to his bid being considered too ‘exorbitant’ for the intended budget. Cable’s reply was more direct as he told the agency director to perform a physical impossibility before he’s train mutants to hunt down their own kind. Only after a personal plea from now Team Supervisor Oswald Geraldo did Xavier agree to house and train the fledging members of Fed-X, a move that was not initially well met by his former students who made up the mutant team better known as the Uncanny X-Men. Several months passed as Xavier trained them to control and master the abilities while trying to determine the psychological impact of discovering their gifts in such sudden and traumatic ways. Working on their psyches as well as their physiques he guided them towards the beginning of self-recovery and acceptance of their true nature as mutants. They also worked hard to win the admiration of their hosts, The X-men which they ultimately did. Shortly before their graduation they met several new members of the team, the rehabilitated mutant Berserk and the man who would be their future field commander during a Danger Room exercise. To their surprise he was not a mutant but the solar-powered powerhouse, Flare. After quickly beating their combined efforts he warned them to not get overconfident about their abilities and warned then the training has really only just started. With tearful goodbyes they left what had quickly become their new home and Xavier extended to each of them an offer to be X-men if they should ever choose to return. With a new extended ‘family’ behind them, they returned to Colorado to meet the remaining members of Fed-X, the super fast duo of Dash and Aero and the mutant healer Medic. Support for Agency X was waning quickly at the same time as cost overruns were already occurring with the team not even officially chartered yet. The Secretary of Defense applied heavy pressure for the team to either successfully complete a high-profile mission immediately or risk being summarily disbanded. The team responded by infiltrating a radical Mutant Rights group who had planted explosives across Washington DC in an attempt to force the passage of a New Mutant rights bill. While Dash and Aero dealt with the bombs, the others attempted to find the master planner and financial backer of the group. Running low on time, Flame attempted to use her telepathic powers to probe the mind one of the captured men only to find they weren’t really human but living automatons under the control of the mastermind. She barely had time to pull her probe back before an outside power caused them all to self-destruct by melting into organic goo. While they saved the day it left a sour taste as the real threat was still at large. Their second case would be more testing. With the scant clues she gotten from the probe and Oswald’s help Flame was able to locate the building close to DC in southern Maryland and the team investigated. It appeared to be an abandoned warehouse but the illusion of normalcy along with the floor collapsed under Brock’s weight revealing a large cavern and an alien ship. Their intent didn’t take long as superhumanly strong automatons came screaming, literally, out of the ship to attack them. While handling them quickly it had left them open for a suddenly blast from behind knocking them all unconscious. They awoke imprisoned on the ship and quickly found their host was N’rvtlr. An alien warrior turned would be ruler who was exiled from his people. After torturing several members to find the extent of their knowledge about his plans they managed to free themselves and fought him to a stand-still. Somewhere in the course of battle the ships auto-destruct was engaged and the team escaped just before it exploded and it seemly consumed N’rvtlr in the blast as well as the warehouse before causing a collapse in the cavern. In the weeks that followed they met new villains such as Scorn, Masque, Trance and the return of N’rvtlr who was now dubbing himself, The Red Monarch as well as Flare’s arch-nemesis, Dr Malice. They would also meet several members of the Superhero community in the form of Spider-man, Ghost Rider, Wolverine, and Golden Age super hero, Thin Man. As they were investigating the mysterious disappearances of several government agents in Upstate Oregon they fell in the trap of Karen Breedlove, a mutant with the ability to control minds with her pheromones. With the men enthralled the Fed-X females had to not only regroup and rescue the men from her control but avoid John Talbot’s Savage Alter ego, the mutant werewolf Moon Dog who was also under her power. After a brutal confrontation with the Lycanthrope they discovered how to block her pheromones. Seemingly captured by Moon Dog, Flame was taken to the villainous Vamp who wanted to experiment on her and make her pheromones affect women as well and sweeping herself into undreamt of power and riches. She wouldn’t get the chance as Talbot interceded at the last moment. She blasted him with a full dose of her mind control pheromones but Talbot wasn’t what he appeared as he changed back into Xerox. The girls had discovered the pheromone had to be inhaled through the nose to work and wore off after a certain time and distance. Putting nose plugs in Talbot to protect him after the effects had worn off so he could switch places with Xerox and free the others while they played along to keep her busy. Furious she attempted to escape while setting her lab on fire. She didn’t get far as the Real Moon Dog found her and was inches away from tearing her throat out for the misery and humiliation she put him through. Despite her mocking taunts to be a true beast he pulled away and let her live saying he may look like beast but the real monster would always be living inside her. Attacking him with a silver dagger as he turned his back on Vamp, Cinder laid her out with a well placed punch. It was right after these events that Xerox began to explore a romantic relationship with His teammate, Cinder. A seeming mismatch, the joker and the shy withdrawn girl started and stalled out several times as they tried to explore the growing feelings between them. Each had to battle their own demons of doubt from their past and it seemed Alora was the first do so when a surprise attack by seemingly rogue Sentinels were in fact part of an ambush by the Nihilist despot, Cataclysm and his forces. After defeating Rocc, Xerox and her sister, Alora was kidnapped to be the final member in his Four Elementals. While his captive she was experimented on and tortured in both body and mind as they warped her powers and sought to bring out her full potential as a pyrokinetic. Weeks of fruitless leads and searching had started to push Xerox, Rocc, and Flame to the breaking point as the team frantically tried to find her. The wait was soon over as she came to find them. A massive explosion brought the full team face to face with Inferno, Cataclysm’s newest warrior who was none other then Cinder, Alora Gannon herself. Renouncing her former teammates as the pathetic masses cuddling the weak from their ultimate end, she engaged them with the other Elementals in a prolonged battle. Unwilling to believe their friend was lost the team tried to reach her. All were met with searing flame-blasts and telekinetic attacks. Effectively beaten the Elementals were recalled by Cataclysm and congratulated. Inferno, furious they did not destroy those who opposed them had to be forcefully subdued by Cataclysm himself as the other Elementals feared her new powers and the rapidly growing violent and cruel personality. Licking their wounds Fed-X began to track down Cataclysm’s base when a mental transmission from Alora pleaded with them to rescue her. Oswald and Flame managed to pinpoint the source of her psychic beacon only to walk into a trap set not by her master but by Inferno herself. For defying their master the other Elementals attacked her but she easily defeated them all, impaling Tremor on his own staff. She then turned her attention to her former allies and team mates. Mad with power, Inferno decimated the team and ground them under her fiery heel. As she lingered to absorb the carnage she had infected on her former friends she was attacked psychically by her sister. In a battle of wills Inferno and Flame fought bitterly in Alora’s mind. She found this personality had always been in her sister, buried deep in her subconscious. She reached for her sister deep inside her mind and finally shocked her awake. Combining their powers they confronted this echo of their past and robbed it of its power over them. Inferno crumpled in a suddenly burst of fire and Alora collapsed into a coma, her mind shut down temporally to heal. Xerox’s blamed himself and the team had no time to console him before Cataclysm reappeared. While the team fought hard He seemed to gain the upper hand until Xerox in a near-suicidal attack began to copy his powers. The weakened mutant couldn’t hold him alone and was severely before being driven into the ground with a tree trunk before Cataclysm left, his prize denied. While in recovery Xerox’ began to show extreme personality shifts finally resulting in him savagely beating several anti-mutant gang members. With little recourse they put him on inactive reserve for psychiatric evaluation. He immediately left the team after a brief battle with his teammates and disappeared. With Xerox missing and Cinder in a coma still Flare, Flame and Rocc asked for leaves of absence. To fill in the empty roster spots several new members were recruited, including Dinn and Blast. Berserk was then promoted to field commander to replace Flare. This new team quickly went to work finding a mysterious assailant who attacked people and left them half dead, drained of their life force some how. They found their vampire to be a young mutant girl who could draw power and strength from absorbing the bio-force of others. Unfortunately she also needed to feed on a portion of it regularly to stay alive. Coming up with a bio-force food bank they solved her problem and gained another member in the process. The team would finally learn whereabouts of Xerox when Magneto extorted the UN into giving him a mutant only nation. Now an Acolyte, he along with other followers began to sweep the island nation of Genosha of its human population while fighting rebel forces. It was believed he died in the following Sentinel attack weeks later. He would reappear later though after being rescued by Flame and Rocc from the island he been marooned after his close escape from Magneto. Wisp, a young mutant befriended by Xerox during his stay in Genosha and who had also left with him, was offered a roster spot and took it while Xerox’s ultimate fate was determined by Agency X. While harshly reprimanded for his previous actions he was allowed to be reinstated in Fed-X only under the understanding that he could not serve on the same team as Cinder to avoid another conflict of interest. Genosha and its aftermath would also show how Fed-X wasn’t able to cope with multiple problems leading to the teams expanding yet again. This marked the beginning of Team Blue under the command of Flame with Flare taking over as Team Gold leader from a less then reluctant Medic. They would soon see action as a conflict of global proportions began. The time traveler, Kang the Conqueror lead an invasion of Earth and his forces soon captured members Team Red and Gold. They would be broken out by Team Blue and the remaining members of both teams and lead an all-out assault on his forces along with other super heroes to force him on the defensive as the Avengers attempted to defeat him once and for all. During this time Agency X would be transferred to the Dept. of Homeland Security and several new regulations were passed regarding membership and security. The teams were reshuffled to meet these new requirements. Mutant members were singled out for special questioning and placed on probationary lock down in the base. Protesting this treatment of his team, Wiz was terminated as Team Supervisor by the Agency X director and replaced with Rem Quesada. Under Quesada even more changes would occur, seriously damaging morale as he seemed to promote rivalry and dissent among the three teams. This would come to a head when Dr Malice assembled Vengeance Unlimited, a group of former foes and freelancers (Dr Malice, Trance, Vamp, Red Monarch, Poppet, Kobold and Backstab) and began an elaborate plan to destroy Fed-X. Temporally capturing Team Blue, Rem would turn out to be the master of disguise, Masqurade working for Dr. Malice as well as attempting to hide from his vengeful former lover, Scorn. Buffeted from all sides they used the villain's egos to tear their team apart by implying Vamp, Trance and Poppet’s powers had been used to make them more agreeable to the team up. Red Monarch then decimated most of his former teammates before being overcome himself. Threatening to expose the fact Agency X had let a known spy deep into its midst Wiz was reinstated as Team supervisor and the former regulations repealed. Still recovering from Masquerade’s deceptions the team found themselves in a game of cat and mouse with the Revitalized Cataclysm. Splitting the team up they fought various aspects of his master plan to cause a global conflict and end all life on the planet. In a daring final move he captured Cinder to reclaim Inferno from inside her and use her thermal powers to release death spores from pods already in low earth orbit. He seemingly succeeded until in a burst of power Cinders burned the spores into ash before they could affect anyone and turned her powers on him. Wounded he retreated by teleporting. Arriving at the X-lair though, they found the lair a wreck, Wiz unconscious along with the mutant, Jump. Cataclysm’s escape it seemed had not been a device but Jump’s mutant power to teleport objects. Jump attempted to battle them teleporting objects at them before trying to teleport them away but using Null’s mutant cancellation ability negated Jump’s power and knocked her out. Cataclysm then appeared that his diversion had worked. A powerful neutron device was buried somewhere deep in the base and set to go off in a matter of seconds so even Dash and Aero’s great speed wouldn’t let them find it in time. Best yet the blast will look like a foreign nuclear strike and cause the world wide devastation he’s so longed for. Jump also learns Cataclysm had duped her when threatening her ‘lost’ parents to obtain her obedience. Jump then teleports the entire base into deep space. Mortally wounded by massively over-extending her powers she tells Xerox to use her powers to get the team back to Earth which he does. Cataclysm attempts to flee the doomed base only to be frozen in place by Jump. Caught in his own explosion Cataclysm is apparently killed along with Jump. The team grieves for the young woman who’d been a close friend and ally to them but Cinder and Xerox doubt Cataclysm is truly dead. With the total loss of their base and all equipment the government disbands the team after a judicial review. Most would try to return to living a normal life while others including Flare either tried solo careers or joining new teams with varying levels of success. It would be months later that an invitation from Moon Dog brought most of the members back to his ancestral manor in New Bedford, Massachusetts. He then proposed to use it as their new headquarters and finance it using the profits from his remaining inheritance and the royalties on Flare’s patents which they accepted. After several successful missions in their new home they were contacted by Agent Sanders of the DHS and forced under their previous oaths to infiltrate Saudi Arabia and root out a mutant terrorist, Hassid, planning to assassinate the Saudi royal family. This turned out to be a ruse by Sanders who had been using Hassid as his personal enforcer in his illicit drug deals before the Second Gulf War and the Invasion of Afghanistan threatened his operations. Hassid, now a liability, was to be killed fighting Team Red then they were be framed for killing the SHIELD team that was about to discover his drug connections. Later, in their capture, they‘d ‘attempt’ to resist and be killed themselves in transport with their bad break with the government being his cover story to their motive. Faking Hassid’s death they then turned the tables on Sanders by stopping his hit squad with Hassid’s help and delivering Sander’s secret hard drive filled with his contacts and accounts to the team. As a gift after their own plane was destroyed, SHIELD gave them two surplus transport cruisers. Months later a reformed Vengeance Inc would attack the house after mind controlling several friends and family to find their new location. After a titanic struggle the team would win but lose not only their newest home but most of their members as Decimation wiped out 99% of all mutant powers on Earth. Financially unable to repair the manor and with all three teams seriously undermanned they disbanded Team Gold and Blue and reformed the remaining members into Team Red. Unlike other teams their identities were not known publicly but several of the former mutants feared going home with violence increasing as various groups began to pick off de-powered mutants. 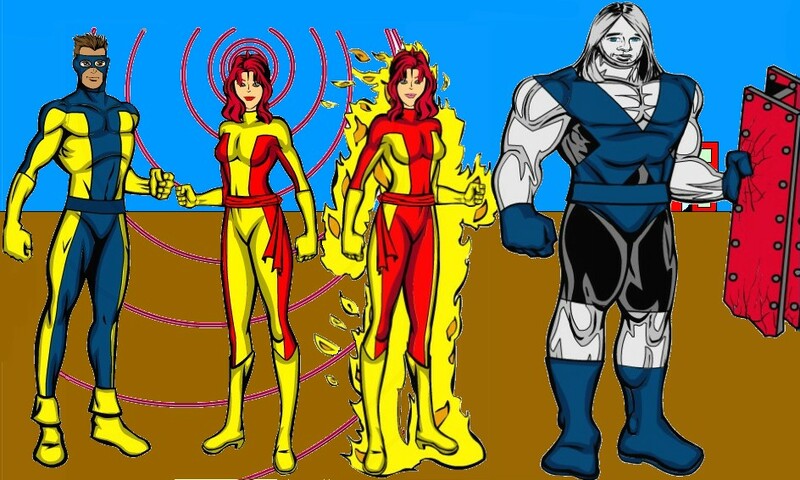 Working with others Matrix and Flare produced several armors and devices to replicate or replace their lost powers and sent them to overseas where the violence was much lessened as their new sister team, the X-Patriots. Buying an abandoned warehouse in Boston under a dummy company they refit parts of it to act as their new base and beefed up the Security as best they could. During Civil War the Team was split on the Superhuman Registration Act even though their public identities were known to the government already. They sided with Anti-registration and acted as a safe house for other superheroes opposed to the act. Even after Tony stark and his pro-faction won they continued to support the underground secretly while joining as Massachusetts Initiative team. Former Members: Berserk, Aero, Dash, Medic, Lattice, Matrix, Din, Blast, Mesmera, Drain and Wisp. Origin: Assembled by the US government to be a strike team and handle problems too large, powerful, or complex for normal means. Place of Formation: Agency X, Dept. of Justice, Washington, D.C.